Payne's Dairies currently supply over 600 retail outlets. 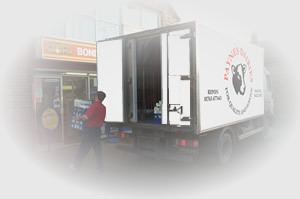 The retail vans cover all of Yorkshire and the larger vehicles have a national coverage. If you are in the catering and retail trade it is important that the products you buy are of the highest quality, the freshest and the most reasonably priced. Payne's Dairies buys the milk direct from the farm, processes it in it's own dairy then delivers the milk using its own refrigerated vehicles. This means that buyers get the milk as fresh as possible, from a company who can offer FULL TRACEABILITY of the milk that has come from farms which comply with the National Dairy Farm Assurance Scheme. New customers please contact us to discuss prices, delivery etc.